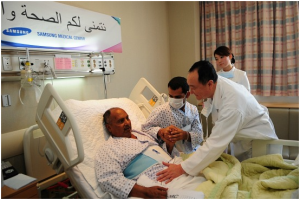 Korea Working Together with UAE, Saudi Arabia for Medical Services? The Korean government is striving to export Korea’s advanced medical technology and systems to the Middle East by means of inter-government cooperation. In this context, Minister of Health & Welfare Jeong Jin-yeop visited Saudi Arabia and the United Arab Emirates between February 20 and 23. In Saudi Arabia, the Seoul National University Bundang Hospital, SK Telecom and ezCaretech have been engaged in a hospital information system project worth approximately 70 billion won since 2014 in a contract with six hospitals under the Saudi Arabian Ministry of National Guard. At present, the system construction process has been completed in two of them, including the King Abdulaziz Pediatric Hospital. In addition, they are moving ahead with a similar project in 300 or so regional hospitals affiliated with the Ministry of Health of Saudi Arabia. During his stay in the country, the minister explained the excellent of Korean hospital information systems and signed a framework of cooperation with Saudi Arabian Health Minister Khalid al-Falih. The transfer of the Samsung Medical Center’s Avatar System is around the corner, too. This system is a genome-based precision medicine platform, and the Samsung Medical Center recently completed working-level talks for the technology transfer with the King Fahad Medical City and the final contract can be singed once the Ministry of Health approves of it. Furthermore, the Ministry of Health & Welfare of Korea and the Ministry of Health of Saudi Arabia signed another framework of cooperation on February 22 for the purpose of practical and systematic cooperation in the fields including hospital information system construction, health insurance and infectious disease response. Mutual cooperation in the pharmaceutical industry is picking up speed, too. As of now, four Korean pharmaceutical companies – BC World Pharm, JW Holdings, CKD Pharm and Boryung Pharmaceutical – are doing business in Saudi Arabia after having signed agreements in March last year in order to export medicine and build a pharmaceutical complex. Each of the four companies has concluded a medicine supply contract with Al Osool, a Saudi Arabian medicine distributor, and Boryung Pharmaceutical signed a technology transfer contract with Sudair Pharma Company last year. In the meantime, entrusted hospital management is in progress on a large scale in the UAE. The Seoul National University Hospital signed an agreement with the Office of the President of the UAE in 2014 and has run the Sheikh Khalifa Specialist Hospital since last year. The Bestian Hospital, a Korean hospital specialized in burn treatment, is about to hold hands with the Al Qassimi Hospital as well. They are planning to conclude an agreement with each other late this month for burn treatment and recuperation, medical facility management, personnel training, etc.